Did a 'gustnado' topple the stage at the Indiana State Fair? Did a ‘gustnado’ topple the stage at the Indiana State Fair? | MNN – Mother Nature Network. Another older post that highlights some interesting and unusual wind events…. Investigators are searching for clues about the Aug. 13 stage collapse at the Indiana State Fair in Indianapolis that killed five people. Some meteorologists think a kind of wind storm called a ‘gustnado’ could be to blame. Cousins to tornadoes, gustnadoes are brief, low-to-the-ground swirling clouds. They are relatively weak compared to tornadoes, but they can still pack a punch and are capable of knocking over weak structures. At the very least, the damage was caused by a strong gust front, or outflow boundary. This front is what separates thunderstorm-cooled air from the warmer air surrounding it. Gustnadoes are known to develop along gust fronts. The gustnado designation hasn’t been given to the Indiana storm by the National Weather Service. “Normally we don’t classify an event as a gustnado,” said Dave Tucek, a meteorologist with the NWS in Indianapolis. According to the NWS storm report, the wind gusts were estimated at between 60 and 70 mph (97 and 113 kph). Gustnado wind speeds can reach 80 mph (129 kph), according to the National Weather Service. Winds of that speed can cause damage similar to that of an EF-0 or EF-1 tornado, the lowest rankings on the tornado damage scale. Tucek told OurAmazingPlanet that from the videos he has watched, he does not see evidence of a swirling motion in the dust and that “it’s hard to say for sure,” whether a gustnado formed. If a tornado had struck, storm survey teams for the NWS would be investigating to determine the strength. The Indianapolis NWS station has no plans to send a team to investigate the wind damage, Tucek said. The Indiana Occupational Safety and Health Administration and the state fire marshal’s office are investigating what caused the collapse, reported the New York Times. Telling the difference between a strong gustnado and a tornado can be tricky. Gustnadoes may be accompanied by rain, just like tornadoes, but they are usually wispy or only visible as a debris cloud or dust whirl — a far cry from the dense and menacing funnel clouds of tornadoes. Yet small tornadoes can seem wispy at first; the key is to look at the top of the suspected gustnado. Unlike tornadoes, gustnadoes are not connected to the storm clouds above, sticking closer to the ground. True tornadoes spin off huge rotating storm clouds, called mesocyclones, which can tower tens of thousands of feet into the sky. Gustnadoes are more likely to be associated with a shelf cloud, a low, horizontal structure in the front of a thunderstorm. This article was reprinted with permission from OurAmazingPlanet. Rare ‘derecho’ storm sweeps across the Midwest | MNN – Mother Nature Network. From July but still interesting…. A severe storm is sweeping across the Midwest today with winds so strong that it has a special name: derecho. A derecho (from the Spanish adverb for “straight”) is a long-lived windstorm that forms in a straight line — unlike the swirling winds of a tornado — and is associated with what’s known as a bow echo, a line of severe thunderstorms. The term “derecho” was first used over a century ago to describe a storm in Iowa. Across the United States, there are generally one to three derecho events each year. The Midwest derecho has wind gusts between 60 and 80 mph (97 to 129 kph), according to the Weather Channel. Iowa, Wisconsin, Michigan and Illinois have all reported severe winds. These severe winds are the main cause of damage from the storm, said Rose Sengenberger, a meteorologist with the National Weather Service in Romeoville, Ill., but added that people should be on the lookout for other dangerous weather. “With any long-lived storm, there is also the threat of lightning and heavy rain,” Sengenberger told OurAmazingPlanet. Tornadoes are not any more likely during a derecho, Sengenberger said. Still, the National Weather Service issued a tornado warning for parts of southwest Michigan. Dangerous rain-wrapped tornadoes could shoot down from the squall line, said the NWS. As their name suggests, rain-wrapped tornadoes are shrouded from view by pouring rains, making them even more potentially dangerous for their ability to surprise. A derecho is not the worst of the windstorms, however. On May 8, 2009, a rare windstorm that swept across Kansas, Missouriand Illinois was in a league of its own. An intense vortex and eyelike structure similar to what forms at the center of tropical storms and hurricanes appeared in the bow echo. The storm was so severe that it earned a brand-new name: super derecho. The super derecho gained strength as it moved across Kansas in the early morning, spinning off 18 tornadoes and packing wind speeds from 70 to 90 mph (115 to 145 kph) when it hit Springfield, Mo. The super derecho plowed a path of destruction through the state about 100 miles (62 kilometers) wide, crossed the Mississippi River with 90 to 100 mph (145 to 160 kph) wind gusts and blew through Illinois before dissipating at that state’s eastern border. Hurricane Katia off the Northeastern US Coastline : Image of the Day. 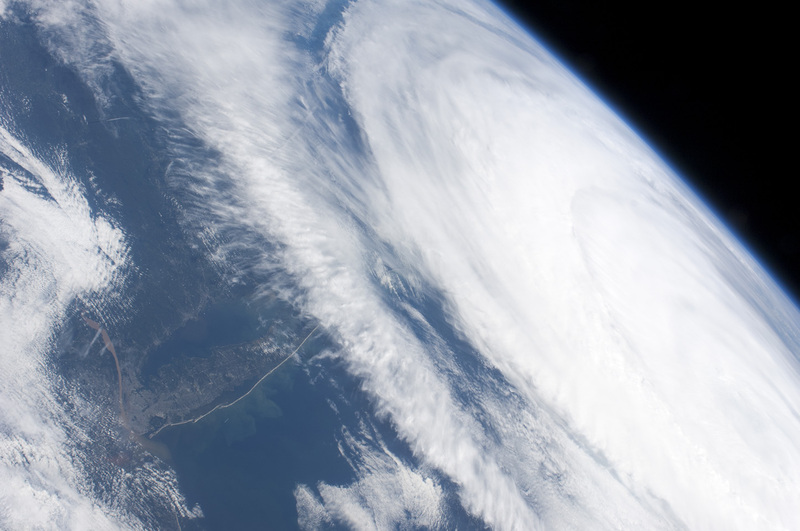 Hurricane Katia had diminished to Category 1 strength on the Saffir-Simpson scale by the time this astronaut photograph was taken, but it still presented an impressive cloud circulation as its center passed the northeastern coast of the United States on September 9, 2011. 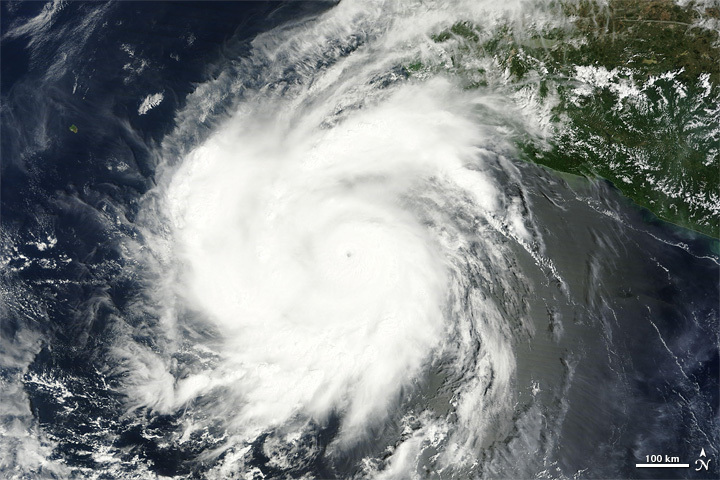 The storm reached Category 4 strength earlier on September 5, making it the second major hurricane of the 2011 Atlantic hurricane season. Katia remained over open waters of the Atlantic Ocean for all of its lifetime, unlike two preceding storms of the season— Hurricane Irene and Tropical Storm Lee—that both made landfall on the continental U.S. The approximate center of Hurricane Katia is visible at image right, with its outer cloud bands extending across the center of the view. A small part of New York—including Long Island and the Hudson River—is visible through a gap in the cloud cover. The Hudson River has a chocolate brown coloration due to heavy loading with sediment, a consequence of flooding and erosion of the upstream watershed by precipitation from Hurricane Irene and Tropical Storm Lee. A plume of sediment is visible entering the Atlantic Ocean on the southern coastline of Long Island, directly to the south of New York City (partially obscured by clouds). Crew members on the International Space Station can take images like this one by looking outwards at an angle through ISS windows—much like taking photographs of the ground from a commercial airliner window, albeit from an average altitude of 400 kilometers (250 miles). Astronaut photograph ISS028-E-45516 was acquired on September 9, 2011, with a Nikon D2Xs digital camera using a 28 mm lens, and is provided by the ISS Crew Earth Observations experiment and Image Science & Analysis Laboratory, Johnson Space Center. The image was taken by the Expedition 28 crew. The image has been cropped and enhanced to improve contrast. Lens artifacts have been removed. The International Space Station Program supports the laboratory as part of the ISS National Lab to help astronauts take pictures of Earth that will be of the greatest value to scientists and the public, and to make those images freely available on the Internet. Additional images taken by astronauts and cosmonauts can be viewed at the NASA/JSC Gateway to Astronaut Photography of Earth. Caption by William L. Stefanov, Jacobs/ESCG at NASA-JSC. Hurricane Hilary : Natural Hazards. Hilary was a Category 4 hurricane on September 24, 2011, according to the U.S. National Hurricane Center (NHC). 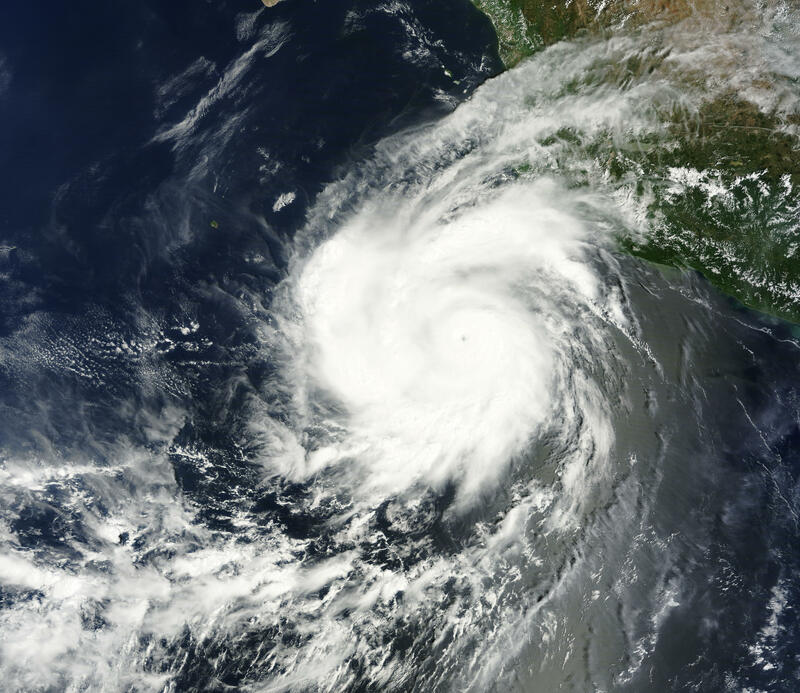 At 8:00 a.m. Pacific Daylight Time (PDT) on that date, the NHC reported that the storm had maximum sustained winds of 140 miles (220 kilometers) per hour, and was located roughly 210 miles (335 kilometers) southwest of Manzanillo, Mexico. The Moderate Resolution Imaging Spectroradiometer (MODIS) on NASA’s Terra satellite captured this natural-color image at 10:40 a.m. PDT on September 24. Although relatively compact, the storm has the distinct eye and spiral shape characteristic of strong storms. The storm lies west of Mexico and is headed farther out to sea. At 8:00 a.m. PDT on September 25, the NHC reported that Hilary was now a Category 3 hurricane, but remained a dangerous storm, with maximum sustained winds of 125 miles (205 kilometers) per hour. Located about 395 miles (640 kilometers) south of the southern tip of Baja California, Hilary had the potential to create life-threatening surf and rip current conditions. National Hurricane Center. (2011, September 25). Hurricane Hilary Advisory Archive. Accessed September 25, 2011. NASA image courtesy MODIS Rapid Response Team, Goddard Space Flight Center. Caption by Michon Scott. Huge Floods in Manila as Typhoon Hits Philippines – TIME. (MANILA, Philippines) — Massive flooding hit the Philippine capital on Tuesday as typhoon winds and rains isolated the historic old city where residents waded in waist-deep waters, dodging tree branches and debris. At least seven people were killed. The typhoon made landfall before dawn over eastern mountainous provinces of Isabela and Aurora, which face the Pacific Ocean, then headed inland through farmlands north of Manila, the government weather bureau said. It was packing sustained winds of 87 mph (140 kph). The first reported death was a 1 year old who drowned in the central island province of Cataduanes after falling into a river, the government disaster agency reported. As the typhoon moved into Manila, a mother and child were killed after their house was hit by a falling tree in the suburb of Caloocan, and four were reported killed by a collapsing wall in the suburb of Valenzuela. Four fishermen were missing while more than 50 others were rescued along eastern shores after their boats overturned in choppy seas. Forecasters warned of 12-foot-high (4-meter-high) waves. Sidewalks and entrances to buildings were swamped and vehicles struggled to navigate the narrow streets. Manila Hospital moved patients from its ground floor, where waters were neck-deep, spokeswoman Evangeline Morales said. Hospital generators were flooded and the building had no power since early Tuesday. Visibility in the city was poor, with pounding rains obscuring the view. Emergency workers were evacuating river areas in the city that are notorious for flooding. An Associated Press photographer said soldiers and police in trucks were moving thousands of residents, mostly women and children, from the Baseco shanty facing Manila port after many houses were washed away. Male family members were reluctant to leave saying they wanted to guard their property. Residents in one neighborhood of Quezon City, a Manila suburb, were fleeing their homes due to rising water from the nearby San Mateo River, radio reported. In the financial district of Makati, a billboard fell on two cars and a bus, causing injuries. With its immense 400-mile (650-kilometer) cloud band, the typhoon threatened to foul weather across the entire main island of Luzon as it moves across the Philippines toward the South China Sea late Wednesday or early Thursday toward southern China. Heavy downpours and winds prompted the closure of government offices, schools and universities in the capital, while scores of domestic flights were canceled and inter-island ferries grounded, stranding thousands. The Philippine Stock Exchange and U.S. Embassy were also closed Tuesday. Waters at the gates of the embassy compound, which is located along Manila Bay, reached chest-deep. A tornado in Isabela’s Maconancon town ripped off the roofs of at least five houses, injuring two people, police said. Power was cut in many parts of Luzon, including in Manila, where hospitals, hotels and emergency services used generators. Tree branches and torn tarpaulins littered the flooded streets. Traffic was light as most people stayed indoors. About 112,000 people were ordered to leave their homes in five towns prone to flash floods and landslides in central Albay province. By Monday, more than 50,000 had moved to government-run evacuation centers and relatives’ homes, officials said. “We can’t manage typhoons, but we can manage their effects,” Albay Gov. Joey Salceda said. Authorities were monitoring farming communities at the base of Mayon volcano in Albay, about 212 miles (340 kilometers) southeast of Manila. Tons of ash have been deposited on Mayon’s slopes by past eruptions, and mudslides caused by a typhoon in 2006 buried entire villages, leaving about 1,600 people dead and missing. The typhoon bore down on the Philippines exactly two years after nearly 500 people died in the worst flooding in decades in Manila, a city of 12 million, when a tropical storm hit. Residents commemorated the anniversary by offering prayers and planting trees Monday. Nesat is the 16th cyclone to lash the Philippines this year. The geography of the archipelago makes it a welcome mat for about 20 storms and typhoons forming in the Pacific each year. Associated Press writer Oliver Teves, photographer Bullit Marquez and videographer Joeal Calupitan contributed to this report. Mid-Latitude Cyclone over the United States : Natural Hazards. 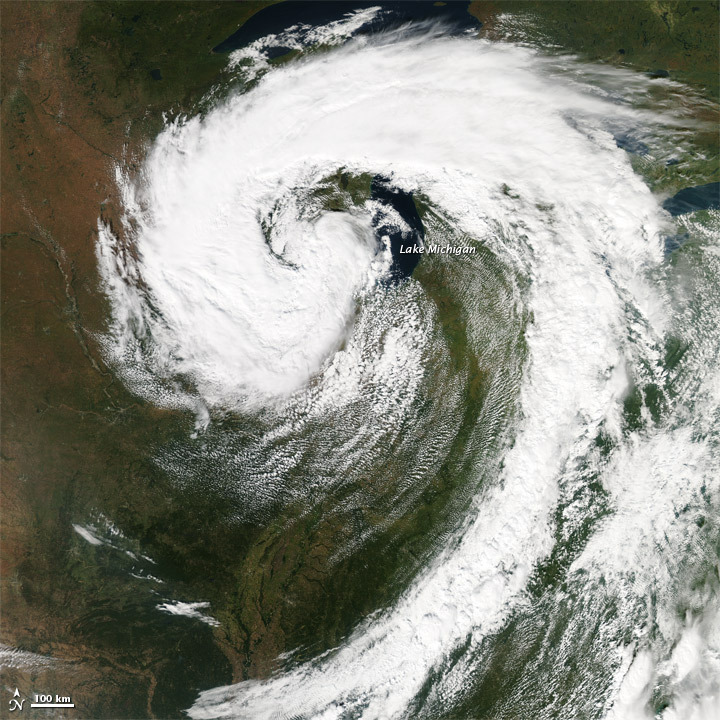 At 3:05 p.m. Eastern Daylight Time on September 26, 2011, the Moderate Resolution Imaging Spectroradiometer (MODIS) on NASA’s Aqua satellite observed a mid-latitude cyclone over the midwestern United States. The center of the storm appeared immediately west of Lake Michigan. The Capital Weather Gang at The Washington Post reported that the storm was at its most mature stage on September 26. Sporting a comma shape spanning hundreds of kilometers, the storm was comprised of a combination of warm, moist air (clouds) and cold, dry air (cloud-free areas). Mid-latitude cyclones drive most of the stormy weather in the continental United States. Development of these cyclones often involves a warm front from the south meeting a cold front from the north. 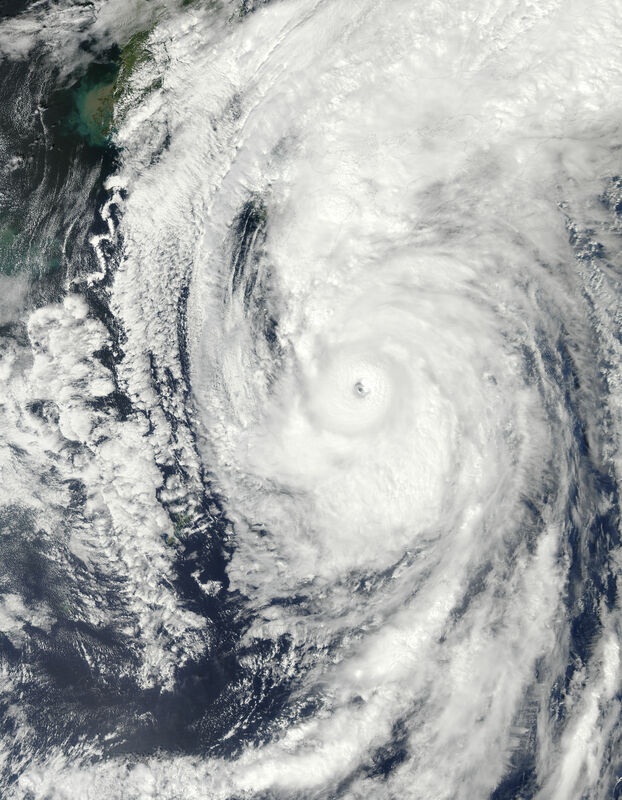 In the Northern Hemisphere, cyclones move in a counterclockwise direction. (In the Southern Hemisphere, cyclones are clockwise.) The bands of cold and warm air wrap around a center of low pressure, and air rising near the center spurs the development clouds and precipitation. Justin Berk, a meteorologist based in Baltimore, explains that in this region, “cold air eventually wins out and wraps completely around a storm. This is called a ‘cold core’ storm and has cut itself off from the main flow of the jet stream.” This, says Berk, is why the September 26 storm appears stalled near Chicago. An animation of the storm from the Geostationary Operational Environmental Satellites (GOES) shows the storm’s progress from September 25 to September 27. Samenow, J. (2011, September 27). 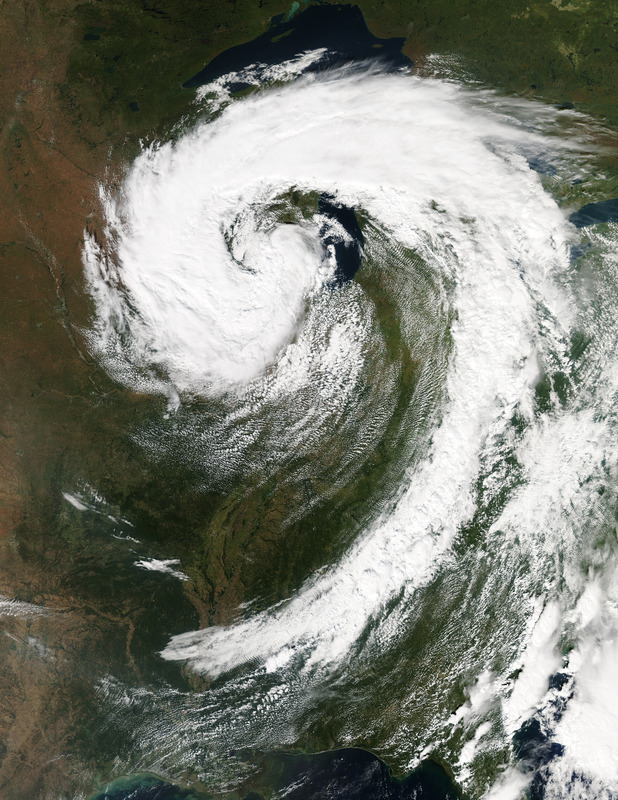 An immaculate mid-latitude cyclone and its decay. Capital Weather Gang. The Washington Post. Accessed September 27, 2011. University of Illinois at Urbana-Champaign. Midlatitude Cyclones. Accessed September 27, 2011. NASA image courtesy Jeff Schmaltz, the MODIS Rapid Response Team at NASA GSFC. Animation from the NASA/NOAA GOES Project Science Team. Caption by Michon Scott. Typhoon Roke : Natural Hazards. Typhoon Roke promises to bring unwelcome rain to areas of Japan still recovering from Typhoon Talas, which triggered landslides and floods across the Kii Peninsula in early September 2011. The new typhoon has the potential to trigger additional landslides and floods, particularly as rainwater builds up behind mud dams formed by landslides during Typhoon Talas. Fearing floods from two rivers, officials in the city of Nagoya ordered the evacuation of 80,000 people and advised more than a million more to evacuate, said The Japan Times. 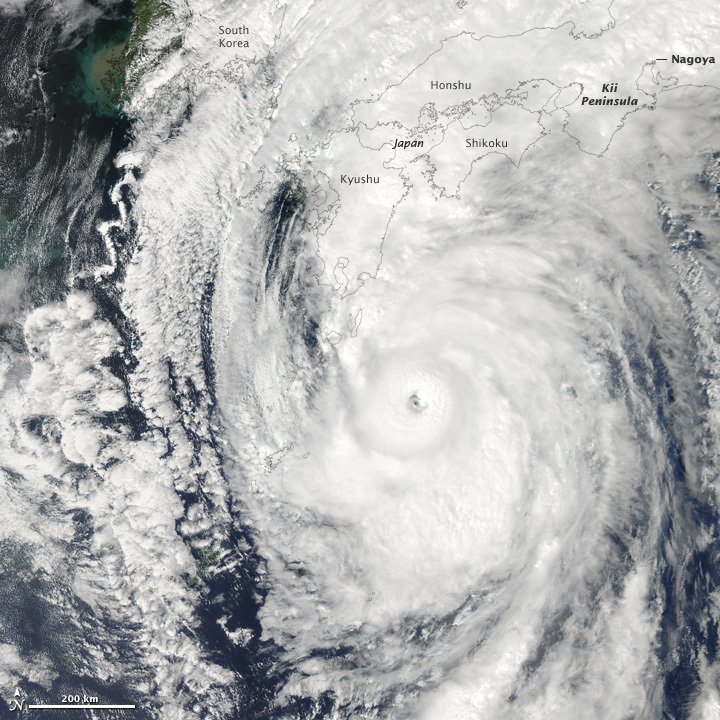 Typhoon Roke was on its way to becoming a very strong storm when the Moderate Resolution Imaging Spectroradiometer (MODIS) on NASA’s Aqua satellite acquired this image at 1:45 p.m. local time (4:45 UTC) on September 20, 2011. The storm is large and well-formed, with a distinct eye. An hour after the image was taken, Roke had winds of 176 kilometers (109 miles) per hour per hour (95 knots), making it a Category 2 storm. Seven hours later, the storm intensified to Category 4, with winds reaching 213 kilometers (132 miles) per hour ( 115 knots). Roke was moving northeast toward the Japanese island of Honshu at 35 kilometers per hour (22 miles/hour) and was forecast to come ashore on September 21, according to the Japan Meteorological Agency. Roke could bring as much as 500 millimeters (20 inches) of rain to parts of Japan. Japan Meteorological Agency. (2011, September 20). Tropical cyclone information. Accessed September 20, 2011. The Japan Times. (2011, September 20). Nagoya orders 80,000 out as typhoon nears. Accessed September 20, 2011. Unisys Weather. (2011, September 20). Typhoon Roke. Data from Joint Typhoon Warning Center. Accessed September 20, 2011. NASA image courtesy Jeff Schmaltz, MODIS Rapid Response Team at NASA GSFC. Caption by Holli Riebeek. Short Sharp Science: Irene from space: covers Atlantic coastline. Hurricane Irene is expected to strike North Carolina Saturday before heading up the coast – potentially hitting the New York metropolitan area and impacting a swath of 55 million people. The category 2 storm has sustained winds topping off at 165 kilometres per hour. Storm trackers were worried Irene would strike as a category 3 hurricane, but the storm weakened overnight. The National Hurricane Center is not currently forecasting an increase in intensity before it makes landfall. Several states have declared states of emergency and evacuations have been ordered for residents as far north as New Jersey. Previous rainfall combined with a new moon tide on Sunday could heighten the slow-moving storm’s impact. Strong hurricane strikes in the northeast are rare but the impending storm raises questions about the readiness of New York City considering the torrential rains and storm surge possible with intense hurricanes. The city is preparing for a potential shutdown of the subway system if sustained winds reach 63 kilometres per hour. This image from the International Space Station shows the giant storm over the Caribbean on Monday. NASA satellites show the diameter of the storm is about one-third of the entire Atlantic coastline. Irene leaves damaging and deadly floods, rushing waters – CNN.com. U.S. East braces for hurricane, NYC orders evacuations | Reuters. (Reuters) – The eastern United States ramped up its alert on Friday ahead of Hurricane Irene and New York City ordered evacuations of vulnerable residents as the broad, menacing storm closed in on the Atlantic coast. As 55 million Americans on the eastern seaboard braced for the weekend onslaught from the nearly 600 mile-wide hurricane, President Barack Obama said its impact could be “extremely dangerous and costly” for a nation that still remembers destructive Hurricane Katrina in 2005. Hundreds of thousands of residents and vacationers were evacuating from Irene’s path, starting in east North Carolina where the hurricane, now packing winds of 100 miles per hour, is expected to make landfall on Saturday. Tropical storm winds were already arriving along the coast of the Carolinas, the National Hurricane Center said. A quarter of a million New Yorkers were ordered to leave homes in low-lying areas as authorities prepared for dangerous storm surge and flooding on Sunday in the city and farther east on Long Island. Some New York hospitals in flood-prone areas were already evacuating patients. “We’ve never done a mandatory evacuation before and we wouldn’t be doing it now if we didn’t think this storm had the potential to be very serious,” New York Mayor Michael Bloomberg told a news conference. Those affected were ordered to evacuate by 5 p.m. (2100 GMT) on Saturday afternoon. Federal and state leaders, from Obama downward, urged the millions of Americans in the hurricane’s path to prepare and to heed evacuation orders if they received them. “All indications point to this being a historic hurricane,” Obama said. Coastal communities from the Carolinas to New England stocked up on food and water and tried to secure homes, vehicles and boats. States, cities, ports, hospitals, oil refineries and nuclear plants activated emergency plans. “We’ve been through about four or five (hurricanes), but this looks like it’ll be the worst,” Henry Burke, a vacation homeowner in Atlantic Beach, North Carolina, told Reuters. “If you are in the projected path of this hurricane, you have to take precautions now …. don’t wait, don’t delay,” Obama said, speaking from the island of Martha’s Vineyard off the Massachusetts coast where he is vacationing. “We all hope for the best but we have to be prepared for the worst,” added Obama, who will cut short his vacation by a day and head back to Washington Friday night. As U.S. authorities ramped up preparations to cope with a potential major natural disaster on the densely populated East Coast, U.S. airlines cut at least 1,000 flights and were moving airplanes out of Irene’s path. Officials are taking every precaution with Irene because they remember all too well how Hurricane Katrina in 2005 swamped New Orleans, killing up to 1,800 people and causing $80 billion in damage. Irene weakened early on Friday to a Category 2 hurricane from a 3 on the five-step Saffir-Simpson scale, but it still was carrying winds of up to 100 miles per hour. It was expected to remain a hurricane as it sweeps up the mid-Atlantic coast from Saturday but the Miami-based hurricane center said it could dip below hurricane strength before reaching New England. But its impact would not vary much. At 5 p.m. (2100 GMT), Irene’s center was churning northward 265 miles south-southwest of Cape Hatteras, North Carolina. Irene, the first hurricane of the 2011 Atlantic season, had already caused as much as $1.1 billion in insured losses in the Caribbean this week, catastrophe modeling company AIR Worldwide said, with more losses expected to come. New York City’s mass transit system, which serves 8.5 million riders a weekday, will shut around noon on Saturday ahead of Irene’s arrival, Governor Andrew Cuomo said in a statement. The NHC said hurricane force winds extended outward up to 90 miles from Irene’s center, while tropical storm force winds extended out to 290 miles, giving the storm a vast wind field width of nearly 600 miles. “The wind field is huge,” U.S. National Hurricane Center Director Bill Read told Reuters Insider. In earlier comments, NHC chief Read said Irene, which will be the first significant hurricane to affect the populous U.S. Northeast in decades, would lash the eastern seaboard with tropical storm-force winds and a “huge swath of rain” from the Carolinas to New England. He said North Carolina would start seeing tropical storm conditions on Friday afternoon. Cities like Washington, Baltimore, Philadelphia and New York could experience heavy rain and wind and power outages from the weekend. Homeland Security Secretary Janet Napolitano urged East Coast residents not to delay precautions. “The window of preparation is quickly closing,” Napolitano said. “This is a big, bad storm,” North Carolina Governor Bev Perdue told CNN. Wall Street firms scrambled to raise cash into early next week in case Irene causes major disruption in trading. Bond trading volume dropped precipitously by noon on Friday. Traders were “watching that big white swirl” on their television sets, said Guy LeBas, chief fixed income strategist at Janney Montgomery Scott in Philadelphia. Northeast oil, natural gas and power facilities also made preparations. Brent crude oil futures rose in choppy trade on Friday as Irene targeted the U.S. East Coast and traders weighed comments by Federal Reserve Chairman Ben Bernanke on the economy. North Carolina, Virginia, Maryland, Delaware, New Jersey, New York and Connecticut have declared emergencies. Irene will be the first hurricane to hit the U.S. mainland since Ike pounded Texas in 2008. In Washington, Irene forced the postponement of Sunday’s dedication ceremony for the new memorial honoring civil rights leader Martin Luther King Jr. Tens of thousands of people, including President Barack Obama, had been expected to attend. Flooding from Irene killed at least one person in Puerto Rico and two in Dominican Republic. The storm knocked out power in the Bahamian capital, Nassau, and blocked roads with trees. MOREHEAD CITY, N.C. – Whipping up trouble before ever reaching land, Hurricane Irene zeroed in Friday for a catastrophic run up the Eastern Seaboard. More than 2 million people were told to move to safer places, and New York City ordered its entire network of subways shut down for the first time because of a natural disaster. As the storm’s outermost bands of wind and rain began to lash the Outer Banks of North Carolina, authorities in points farther north begged people to get out of harm’s way. The hurricane lost some strength but still packed winds of almost 100 mph, and officials in the Northeast, not used to tropical weather, feared it could wreak devastation. Hurricane warnings were issued from North Carolina to New York, and watches were posted farther north, on the islands of Nantucket and Martha’s Vineyard off Massachusetts. Evacuation orders covered at least 2.3 million people, including 1 million in New Jersey, 315,000 in Maryland, 300,000 in North Carolina, 200,000 in Virginia and 100,000 in Delaware. “This is probably the largest number of people that have been threatened by a single hurricane in the United States,” said Jay Baker, a geography professor at Florida State University. New York City ordered more than 300,000 people who live in flood-prone areas to leave, including Battery Park City at the southern tip of Manhattan, Coney Island and the beachfront Rockaways. But it was not clear how many would do it, how they would get out or where they would go. Most New Yorkers don’t have a car. On top of that, the city said it would shut down the subways and buses at noon Saturday, only a few hours after the first rain is expected to fall. The transit system carries about 5 million people on an average weekday, fewer on weekends. It has been shut down several times before, including during a transit workers’ strike in 2005 and after the Sept. 11 attacks a decade ago, but never for weather. Hundreds of thousands of airline passengers were grounded for the weekend. JetBlue Airways said it was scrubbing about 880 flights between Saturday and Monday, most to and from hub airports in New York and Boston. Other airlines said they were waiting to be more certain about Irene’s path before announcing more cancellations. Thousands of people were already without power. In Charleston, S.C., several people had to be rescued after a tree fell on their car. Defying the orders, hardy holdouts in North Carolina put plywood on windows, gathered last-minute supplies and tied down boats. More than half the people who live on two remote islands, Hatteras and Ocracoke, had ignored orders to leave, and as time to change their minds ran short, officials ordered dozens of body bags. The last ferry from Ocracoke was set to leave at 4 p.m. Friday. Officially, Irene was expected to make landfall Saturday near Morehead City, on the southern end of the Outer Banks, the barrier island chain. But long before the eye crossed the coastline, the blustery winds and intermittent rains were already raking the coast. National Hurricane Center meteorologist David Zelinsky said earlier Friday that he expected the storm to arrive as a Category 2 or 3 hurricane. Later in the day, other forecasts showed it would strike most of the coast as a Category 1. The scale runs from 1, barely stronger than a tropical storm, to a monstrous 5. On Friday afternoon, Irene was a Category 2. Officer Edward Mann was driving down the narrow streets of Nags Head looking for cars in driveways, a telltale sign of people planning to ride out the storm against all advice. Bucky Domanski, 71, was working in his garage when Mann walked in. He told the officer he planned to stay. Mann handed Domanski a piece of paper with details about the county’s evacuation order. It warned that hurricane force winds would flood the roads and there might not be power or water until well after the storm. “You understand we can’t help you during the storm,” Mann said. After the Outer Banks, the next target for Irene was the Hampton Roads region of southeast Virginia, a jagged network of inlets and rivers that floods easily. Emergency officials have said the region is more threatened by storm surge, the high waves that accompany a storm, than wind. Gas stations there were low on fuel Friday, and grocery stores scrambled to keep water and bread on the shelves. In Delaware, Gov. Jack Markell ordered an evacuation of coastal areas. Officials at Walter Reed Army Medical Center in Washington said they were speeding the transfer of their last remaining patients to the National Naval Medical Center in Bethesda, Md. The transfer had been planned for Sunday. In Baltimore’s Fells Point neighborhood, one of the city’s oldest waterfront neighborhoods, people filled sandbags and placed them at the entrances to buildings. A few miles away at the Port of Baltimore, vehicles and cranes continued to unload huge cargo ships that were rushing to offload and get away from the storm. In New York, the Mets postponed games scheduled for Saturday and Sunday with the visiting Atlanta Braves, and the Jets and Giants moved their preseason NFL game up to 2 p.m. Saturday from 7 p.m.
And in Atlantic City, N.J., all 11 casinos announced plans to shut down Friday, only the third time that has happened in the 33-year history of legalized gambling in that state. Jennifer Peltz reported from New York. Associated Press writers contributing to this report were Bruce Shipkowski in Surf City, N.J.; Geoff Mulvihill in Trenton, N.J.; Wayne Perry in Atlantic City, N.J.; Eric Tucker in Washington; Martha Waggoner in Raleigh, N.C.; Mitch Weiss in Nags Head, N.C.; Alex Dominguez in Baltimore; Brock Vergakis in Virginia Beach, Va.; Jonathan Fahey in New York; and Seth Borenstein in Washington.